Vagnbys Wine Decantiere 7-in-1 Aerator. A must-have companion for the wine enthusiast. Decants and aerates instantly Built-in filter Airtight stopper Easy pouring Covers foil edges and hides screw threads 2.65 oz 2"w x 2.75"l x 7"h For ages 21 and up Bold subhead Decant and aerate wine instantly! Vagnby's Wine Decantiere 7-in-1 Aerator is easy to use and ensures optimal performance. Its air-mixing chamber gently oxidizes wine during pouring, significantly improving taste, flavor and finish. Seven built-in dual-functional tubes are supported by eight small vents positioned at the grid edge. The dual pouring edge ensures no dripping, while the built-in filter protects against cork residue and other impurities. The air-tight stopper preserves freshness so your wine doesn't go to waste plus covers foil edges and hides screw threads. 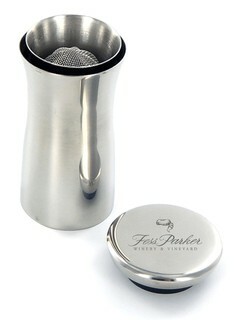 This beautifully designed aerator is a must-have accessory for every discerning palate.